This year's Burning Man festival is in full swing in the Nevada desert, where revellers are sharing photos of the architectural and sculptural projects they have built on the dusty site. Almost 70,000 attendees have constructed their temporary settlement known as Black Rock City on the arid plain, where they will live from 27 August to 4 September 2017. Although internet connectivity is limited, hundreds of images showing the complex and intricate installations have emerged on Instagram – giving those at home a peek at life on the "playa". Some of the most impressive structures and artworks for 2017, created around the theme of Radical Ritual, include the pagoda-shaped pavilion housing the huge wooden man that will be burnt at the end of the festival. 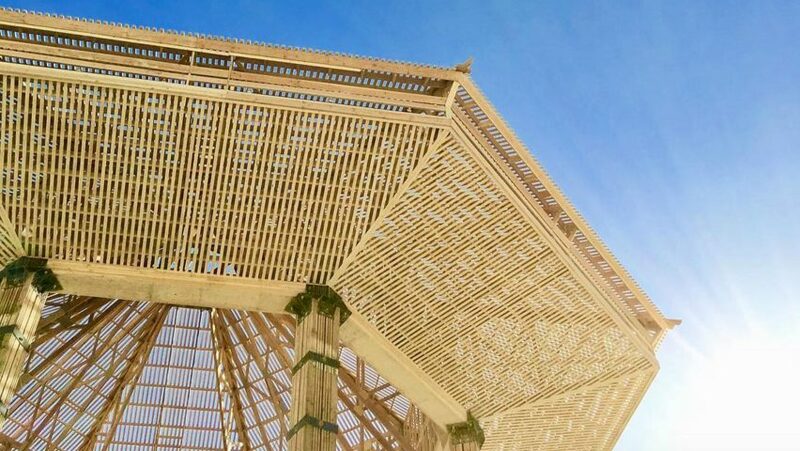 Equally grand is this year's Temple – designed by Steven Brummond, Marisha Farnsworth and Mark Sinclair from Oakland, California – which is built from stacked wooden bars. Other designers attending this year include Ralph Nauta from Studio Drift, who has installed the interactive Tree of Ténéré. The tree lights up based on three swarm algorithms, which react to the movement, heartbeat and eye blinks of those wearing headsets. Alex Josephson of Toronto firm Partisans has also travelled to Nevada for the event, and is documenting his first Burning Man experience via his Instagram account. Some of the most photographed artworks so far include a 30-foot-tall (nine-metre) wooden owl called Múcaro, created by Los Angeles based El Nino, and Zachary Coffin's Temple of Gravity that comprises huge stones suspended from five thin steel arms. Burning Man was founded by Larry Harvey on a San Francisco beach in 1986, before he moved the festival to the desert in 1991. The city is built in a horseshoe layout, which Harvey said was crucial to the event's success during an interview with Dezeen in 2015. Since 1998, Canadian photographer NK Guy has been documenting the artworks built each year before they quickly vanish after a few days. NK Guy documents 16 years of creating and destroying Burning Man's temporary "city"